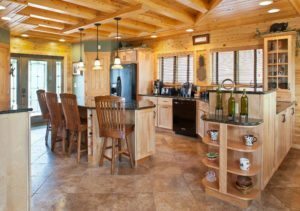 Once your Katahdin Cedar Log Home is enclosed, the work will begin on your home’s interior systems for water, power, connectivity, heating and cooling. We checked in with long-time Katahdin Dealer Bill Ryan, of North Point Contracting, to get the skinny on inside work on plumbing, HVAC & electric. Since each of these tasks will likely be completed by subcontractors, Ryan emphasized the challenge that many area contractors face with subcontractor availability. Each dealer or builder has a platoon of plumbing, HVAC & electric subs they rely on, often coordinating their work with care to perform as seamlessly as possible. This means getting materials onsite, having necessary prep work completed so other workers can proceed and thus ensuring that each step is completed the right way. “Where it can get tricky is when there are delays from weather—which experienced contractors include in planning,” Ryan said. 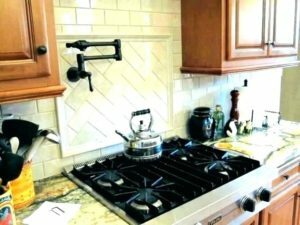 “Changing essential elements, such as plumbing fixture location, can wreak havoc on a building schedule, because of the demanding schedules for plumbers and electricians.” His advice to clients is to keep to your original plans as much as possible! On the subject of jacuzzi style tubs in the master bath, he recommends either a soaking only tub or an outdoor hot tub. Interior spa tubs can be problematic, and in reality, used infrequently. Opting for an outside spa can save money as well! Make sure your home is prepared for the coming generations of electronics—it’s an excellent investment! Even if you don’t plan on using smart appliances or home assistants, creating your own home connectivity can keep televisions, computers and internet connections fast, by allowing your Wi-Fi to drive handheld smart phones and laptops. 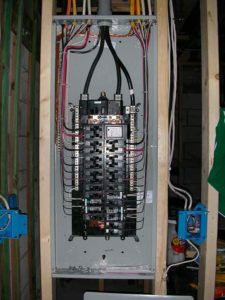 We reviewed some of the options for wiring connectivity in this article. Be aware that your regular electrician may not be up to speed on broadband connectivity and may need direction from a computer expert. For HVAC, Ryan prefers the efficiency and performance of mini-split heat pumps and has include those in plans for several recent Katahdin projects. If you’re looking for a more integrated whole house HVAC system, combining a single heat pump system with efficient ventilation can reap savings and comfort. While heating with fuel oil or propane are always options, opting for a lower carbon footprint and high efficiency is the way of the future. 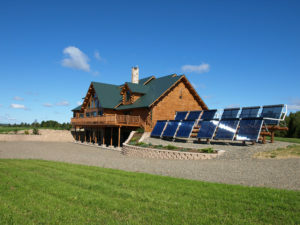 Katahdin’s Solar Ready program puts Katahdin customers in touch with solar power pros to develop integrated solar arrays with home HVAC to create an efficient, comfortable and healthy Katahdin Cedar Log Home for your family.